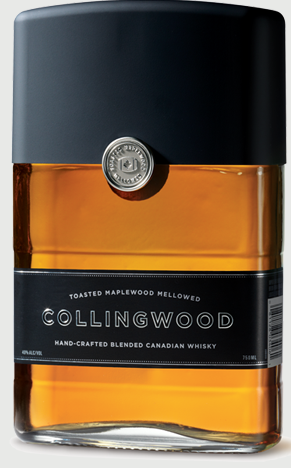 Collingwood’s component whiskies are triple distilled and aged for at least three years in white oak. During a marriage period in stainless steel tubs, toasted (not charred) maple wood staves are added to the vat, floating on top and imparting the very unique flavors associated with this rarely used component. Maple wood contains very little tannic acids, lending a smoother, less bold result in the final product. Also, because the wood is toasted, the sap in the maple wood has a much bigger impact on the flavor making this curious Canadian whisky that much more Canadian for us Yankees. Love it. Collingwood promises a mellow, smooth sip based on these numerous factors specifically designed to calm this very young spirit. While smooth sipping is plus, it doesn’t matter a Canadian hill of beans if the flavors do not succeed as well. So, on to it…. Nose- Obvious presence of maple and vanilla. A curious waft of maraschino cherry along with fruity blackberry. Jam-like or pie filling, one of the two. Red liquorice. Thick. Taste– Very calm, smooth mouth feel and taste but without grip. Flavors from nose re-appear, add coffee and cocoa. Tangy vibrancy. Finish– Short. Attack of cherry Nyquil then drying cocoa powder. Drops off quickly to dull bitterness. Comment- Quite unique, but frankly the novelty wears off quickly. Points for smoothness and drinkability despite its age but our interest wouldn’t last an entire bottle, sadly. The innovation is interesting, however, and we recommend a test drive of this peculiar bottle, you might land elsewhere. I would suggest the Collingwood 21 year Rye but that one is hard to come by. This is a mixer.